Washington, DC (March 11, 2009) – A coalition of Hispanic leaders today launched the National Alliance for Hispanic Families, a bold and innovative initiative aimed at harnessing public and private resources to strengthen Hispanic families throughout the United States. The new organization plans to promote comprehensive program services, relevant research, and strategic public policy decisions that promote and strengthen Hispanic families. Leaders of the Alliance believe that current social service programs often focus too narrowly on individuals alone, rather than within the context of their families. The group’s goal is to create a long-term strategy that works with and through families and provides an environment in which children and youth flourish. For Hispanics, the drop-out rate is one of several challenges. Studies show that in 2007, nearly 30 percent of all Hispanic children lived in poverty, and an increasing number of babies were born out of wedlock to Hispanic teenage mothers. “We want to bring the issues facing Hispanic families to the forefront while promoting comprehensive social service strategies that leverage the community’s greatest asset – the family,” says Dr. Blanca Enriquez, a leader in Head Start programming and member of the NAHF executive committee. The framework of the Alliance was formed during a meeting last November where leaders from across the country discussed the need for a national plan to expand the work of the Hispanic Healthy Marriage Initiative currently funded by the department of Health and Human Services. Members of the group’s executive steering committee include Frank Fuentes, HHS; Dr. Blanca Enriquez, El Paso Head Start; Jose Villalobos, TELACU; Dr. Alicia La Hoz, Chicago Family Bridges Project; and Lisa Treviño Cummins of Urban Strategies. In June, the organization’s founders will host a national leaders forum in Washington, D.C. to further develop the Alliance’s long-term strategy to build on the Hispanic communities’ assets to serve families in need. Mas de 45 lideres de la communidad, grupos de fe, y de alta educacion se reunieron los dias 25 y 26 de marzo para una sesion de entrenamiento auspiciada por el grupo National Alliance for Healthy Families (NAHF) y la empresaria Urban Strategies en Santa Isabel, Puerto Rico. El grupo se reunio para explorar el tema de come se puede trabajar en conjunto para crear programs effectivos con el proposito de reenforzar las familias en la parte sur de la Isla. Las discusiones provocaron mucha pasion en los participantes y cada voz que se alzaba fue honrada con respeto y con proposito. “Este es un dia historico!” exclamo un participante. “Es el comienzo de la gente luchando por la gente. No podemos esperar mas para que alguien lo haga por nosotros. Necesitamos hacerlo nosotros por nosotros mismos.” Un participante joven de 13 anitos observo que “la familia y los padres son importante. Cuando nenes no tienen sus padres para que los escuchen o para guiarlos, ellos buscan otra gente que los escuche y eso no es bueno porque otros posiblemente no saben o no les dan el mejor consejo. Nuestros padres nos aman y es necesario dialogar.” El grupo de lideres pasaron por algunos ejercicios sobre el tema para determinar las necesidades y los pasos para tomar, organizandose en un nuevo grupo llamadoPuerto Rico Family Service Alliance (PRFSA). Los dos dias de entrenamiento concluyeron con un ambiente de entusiasmo dispuestos a apoyar e implementar un plan de accion que se llevara acabo en los siguientes nueve meses. 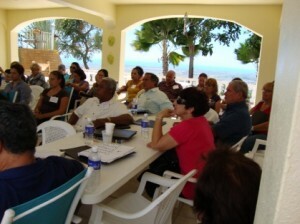 More than 45 community, faith, and higher education leaders came together March 25-26 for a training session sponsored by NAHF and conducted by Urban Strategies in Santa Isabel, Puerto Rico. The group met to explore how they could work together to create effective programs to strengthen families in the southern part of the Island. Following exercises to determine needs and next steps, participants organized themselves into a new group called the Puerto Rico Family Service Alliance (PRFSA). The two-day training session wrapped up with enthusiastic support for an action plan to be implemented over the next nine months. My dad was a rancher and my mom was a housewife. Last year I completed my doctoral program. Walking across the stage to receive my PhD made me realize that accomplishing a dream takes determination. For me, the determination to walk across that stage came from many, many talks on summer evenings eating watermelon with my grandparents on their porch, listening to their “consejos” about what it takes to be successful in life. This determination was what I learned from watching my mom make ends meet after a tumultuous marriage and divorce. My determination to succeed was met with many challenges. 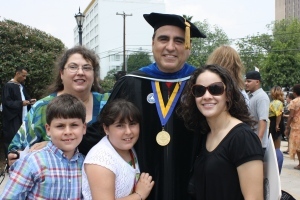 My first challenge came when I decided to go to college rather than “work on the ranch.” There was no pressure to attend college, and none of my friends were motivated to leave Laredo, TX. The struggle I went through accomplishing my first degree was overcoming my shyness to move to Austin after living in a small city and spending most of my weekends at the ranch. The next challenge came in making the decision to travel 300 miles for every weekend class from Laredo to San Antonio and back. For two years, every weekend, at four or five o’clock in the morning, I would start out for class. The first year into my program, I changed jobs, my wife and I had twins, and unfortunately my mom was diagnosed with pancreatic cancer. I completed my program with a 4.0 grade point average, all while trying to be a good husband, dad, and son. My mom passed away shortly before graduation. I promised her I would continue until I completed my PhD. This entailed another six years of driving 150 miles to San Antonio and another 150 miles back to Laredo. Walking across the stage last year made me think of all these challenges — driving at all hours of the night, missed birthday parties, missed weddings, missed time spent on many special family occasions. But walking across the stage also made me realize that the most awesome feeling of accomplishing my dream is knowing my children were part of this journey. To them, the “norm” is going all the way to achieving their doctorate. I was able not only to change my generations’ accomplishments, but also the generations to follow. My son’s dream is to become a paleontologist and my daughter wants to become a heart specialist. Most of all, I was able to keep my promise to both myself and my mom. I was blessed with the unconditional love of my grandparents, my mom, my brother, my sister, my wife, and now my children. That’s my story…from the heart! Editor’s Note: Please send your family story to NAHF for publication in future posts to christyrosche(at)hispanicfamily.org. For a group of immigrants living in Nebraska, self-identity is defined by family. Last month, during snowy and blistering cold conditions, a leadership workshop was conducted for families of Grand Island, Nebraska. Yes, there are Latinos in Nebraska! These families came to learn how to lead their children to a successful life through a series of leadership workshops. Over and over I heard mothers and fathers define themselves by the work they did for their children. In a group activity, parents were asked “what are you good at doing?” I expected to hear them respond with talents such as playing soccer or singing. Without hesitation all but one of the 50-plus participants proudly talked about their job, not only the type of work they were involved in, but the consequence it had on their family. 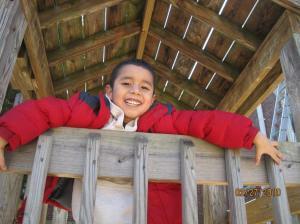 National Alliance for Hispanic Families All rights reserved.